Paul Hill blogged about his recent experience at the Christianity21 conference. It's a good post. Go check it out... I'll be here when you get back. At EC21 the speakers intentionally and frequently used [the f-bomb], commented on using it, and nearly celebrated using it. I don't see how this communicates relevancy so much as it is pandering to the audience. It's hard for me to separate when someone is using salty language for emphasis and when they're just showing off. I certainly am no stranger to profanity, and I'm not personally offended when someone f-bombs...but, I'll admit to being annoyed at times. It's as if some of these folks are saying, "Look at me...I said a naughty word!" Then again, I'm probably not the intended audience for the speakers at events like Christianity21. (White, middle class, suburban, midwestern, life-long Lutheran, pastor's kid, etc.) I really love what Emergence Christianity has done to draw the church out of it's fuddy-duddyness. Furthermore, most of the emerging leaders are doing the kind of ministry I don't have the courage to event attempt. If cursing and tattoos and piercings are part of the Relevance Package for these ministers, who am I to say they should stop? Jake and I wrestled with the topic of profanity when assembling Cancer & Theology. Several of the authors used words that would make my grandmother blush. For a variety of reasons we kept their original language in the book. We did this recognizing there are some people who will miss out on an excellent message because the writers employed a handful of curse words. When it comes to the use of curse words, it's probably a living-in-the-tension situation, which, I'll admit, feels like a cop-out. For me, it's about knowing your audience (whether it's a large assembly or a small group) and understanding when an f-bomb will convey passion and emphasis...and when it will distract and offend. What do you think? Is it okay for a pastor or church leader to use a "bad word" when writing or speaking in public? Of all the words in the English language, I can think of none more offensive, violent, or profane than this word. I don't know a single person who hasn't been touched by cancer in some way. A family member. A close friend. A co-worker. A classmate. A parishioner. Everyone knows someone (probably many someones) who has encountered cancer. Two and a half years ago, a young mother in my congregation was diagnosed with an aggressive form of brain cancer. The diagnosis came with a near certain death sentence. Chemotherapy and radiation followed a rather invasive surgery to remove part of the tumor. As she was in the process of making a miraculous recovery, my good friend Jake was diagnosed with lymphoma. It was in the midst of his treatment (and eventual recovery) that he reached out to a handful of Christian scholars, pastors, and leaders. His request was simple—write essays which help people think theologically about illness and death. There is great wisdom and candor found in each of these sixteen essays, several of which originally appeared on Jake's blog. 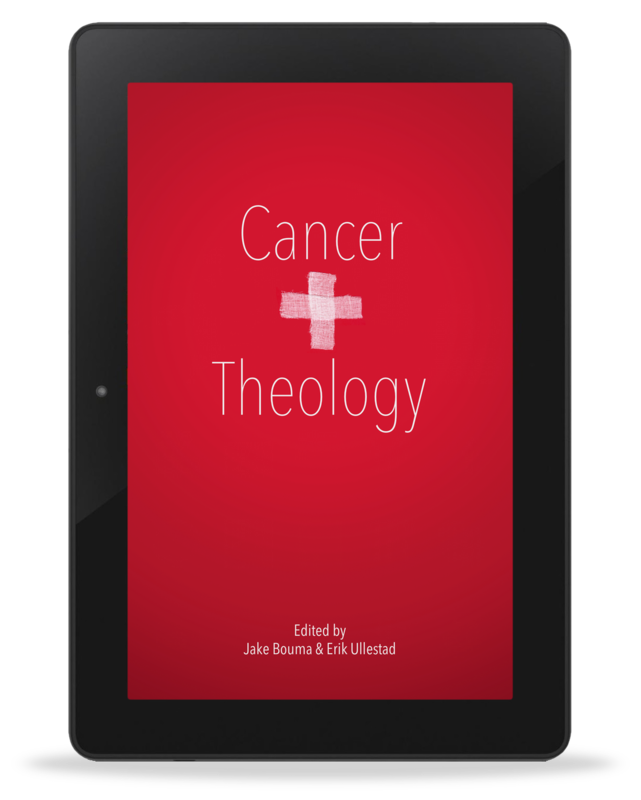 Last week the essays were gathered into an e-book called Cancer & Theology which is now available for purchase on Amazon.com. A paperback version will be ready on February 1. A portion of all proceeds will support the Leukemia & Lymphoma Society. These essays have helped me wrestle with how I understand God's activity in the midst my friends' journeys with cancer. If you have been touched by cancer, I believe Cancer & Theology will speak to you as well.